Good morning, readers, followers, friends, and colleagues from all over the world! It is a pleasure for me to welcome you to my coffeece for our little weekly rendezvous! Please, don’t be shy and have a sit. As you can see, today’s guest is Martine with her sunny smile – Welcome, my dear! How was your short flight to Italy? *just joking*. I am so happy to have you here! Thank you so much for taking the time to pay me a visit, share thoughts and “dirty” secrets, and have a lovely chat over coffee with me. We have not had the chance to meet in person, yet! But, I am sure that the year 2016 will be full of surprises.  We have already talked the chance to meet at an International event, haven’t we? So… who knows? I hope that it can happen! Let me explain you and our readers how this works. You have six sets plus a Bonus Qs section of questions. The questions cover your personal profile rather than the professional one. In fact, usually, we talk a lot about us as professionals: we show our skills, how we manage assignments and deal with working stress and anxiety, what we can do, and how we do it. Conversely, today, you are going to talk about yourself. You are going to show us Martine, ok? ▷ I have just one name, Martine, and I don’t like it that much. Isn’t it ironic? (LOL!) I am Italian (despite my name) and Martina (the equivalent of my French name) was very popular in Italy during the eighties, when I was born. But my parents opted for the French version which was in fashion in the … fifties and sixties -OMG!! !- Now that I live in France, I am surrounded by women called Martine, who are over 50, most of the time! But let’s be objective: I must admit that among all the “vintage” names I could have, Martine is definitely not the worst … it is punchy and full of energy (pretty much like the sound of a door bell! LOL) and it reflects a lot who I really am. ▷ I am a professional EN/FR/ES into IT freelance translator. I translate everything related to marketing/commerce, tourism, cosmetics, pleasure boats/sailing, banking, domotics. ▷ I’ve been living in the North of France (Lille) for 10 years now. I came here to do “a test” with my French husband, after living separated for 3 years, and it seems that we passed the “exam” with honors!  Before that, I lived in Spain, Italy (of course) and briefly in Australia. ▷ I started learning English when I was in the middle school. My English teacher was my favorite one; I think that she really instilled the love for languages in me. I knew that I would use the foreign languages for a living “when I grow up” –but I definitely didn’t know “how”, at that time. Later, when I was in high school… I got closer to translation and I’ve never really left this beautiful profession since then! ▷ I’m pretty much a “DAY” person, I’m very active and I really need to know where to buy extra hours for the day LOL! But I also love the night because it’s MY OWN special moment, I can relax and select the “chill-out” mode –when I do not go out with family and friends or have frenzy children around who do not want to go to sleep– LOL!. ▷ Sea … just because it’s more likely to have warm temperatures –I am a “summer person”–. I love mountain though, and fancy changing “destination” as well..
▷ I used to play flute at school and didn’t like it at all! If I was an instrument I’d definitely be DRUMS! It reflects pretty much my personality and yes! I’d love learning to play drums one day. ▷ My telephone charger … I got addicted to my smartphone! ▷ I am definitely a foodie and a “chef” from time to time as well. I love eating but I don’t really have one favorite food. ▷ I’ve never been a true “sporty girl”, who is 7/7 in the gym, but I played volleyball at a competition level for 10 years (and still do but I have “fallen down” to an “amateur” level now).  I tend to go where motivation/passion leads me and volleyball is the only 100% motivating sport for me. ▷ Jungle Speed, Trivial Pursuit, Dixit. ▷ The last book I read was Erri de Luca’s Il giorno prima della felicità. I’m currently reading, Storia di un corpo by Daniel Pennac (“my” French Stefano Benni… I love this guy’s style!). ▷ I have a smartphone Android. ▷ It depends … I think that the concept behind Twitter is very smart but 140 characters are also very limiting (I’m still learning how to synthetize information when I post something! LOL). Facebook is pretty good to exchange information and connect with people! Well, I have a confession to make. I started being a geek thanks to an Amiga 1200. We are not old, we are limited edition!  Women who know how to use one of the first machines ever produced are simply irresistible. Anyway, good to know! You are very funny, Martine! Actually, I wouldn’t interrupt you and stop our interview just yet, but time is up for today! As I said, it is your week and we will be back on Thursday! So… let’s meet up in two days! Follow me and Martine to read the updates and send us any question or just share opinions! Who’s Martine? 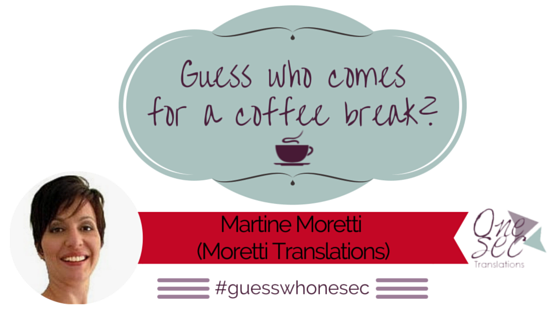 ▷ Martine (from Moretti Translations) is a professional EN/FR/ES into IT freelance translator and a liaison interpreter. She translates in the following fields: marketing/commerce, tourism, cosmetics, pleasure boats/sailing, banking, domotics. She obtained a MA in Translation and a University Degree in Foreign Languages. Martine is a compulsive reader, a traveler –she hopes to win the lottery to be able to make a world tour– with a passion for foreign languages, music, volleyball, fine cooking and anything related to the Spanish culture and language. You can find her on Facebook, Twitter, and LinkedIn.